ATV wheel clamps attach to NextGen™ Ranger R745 tire changer. Make sure to explore the correct clamp model, so you get the right one for your vehicles and needs. This complete ATV/motorcycle adapter kit is designed to increase the clamping capability of the Ranger R745 tire changer. The motorcycle adapter kit is installed over the existing turntable clamping jaws to increase the total external clamping range. The raised height of the motorcycle adapter kit allows motorcycle and ATV wheels to be elevated above the solid rim clamp turntable. In the raised position, rear wheels can be clamped, making sprockets or hubs obsolete. They feature heavy steel construction, plastic wheel grips to prevent damage to expensive wheels, an anodized finish and quick-release, spring-loaded locking pins that keep clamps secured safely to the cable. It’s the entire package—exactly what you’d expect from Ranger. Motorcycle and ATV tire changer adapters let you change small, difficult tires the easy way. 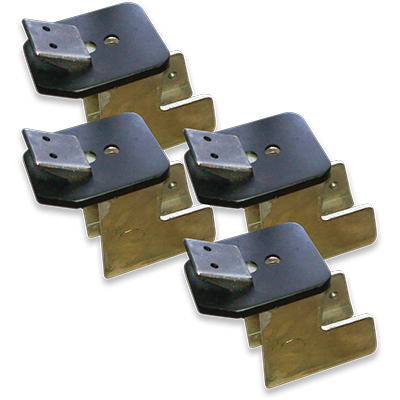 These elevated expansion clamps include four adapters that fit over the standard tire changer jaws to accommodate motorcycle and ATV wheels, increasing the maximum wheel diameter range an additional four inches.